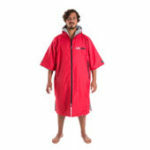 The Surf Academy Changing Robe is a soft and absorbent towelling surf poncho. Made using 100% cotton these hooded changing robes are perfect for getting changed on the beach after a surf and provide vital protection from the elements. The top quality 400gsm Turkish cotton is used throughout the changing robe for a luxurious feel and will keep you super warm as well as drying you as you get changed. With the Surf Academy Changing Robe you can get changed at the beach without having to worry about exposing yourself to the elements (or your mates). This towelling poncho is also available in adult sizing. Great quality, speedy delivery, all you can ask.